We covered regular divergences in the previous lesson, now let’s discuss what hidden divergences are. Divergences not only signal a potential trend reversal; they can also be used as a possible sign for a trend continuation (price continues to move in its current direction). Always remember, the trend is your friend, so whenever you can get a signal that the trend will continue, then good for you! This can be seen when the pair is in a UPTREND. 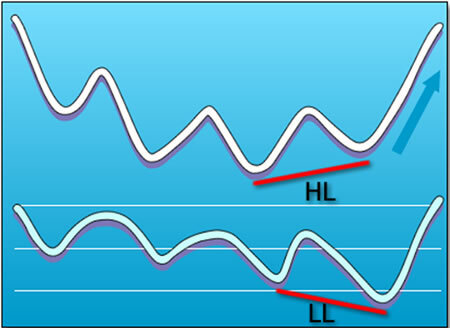 Once price makes a higher low (HL), look and see if the oscillator does the same. If it doesn’t and makes a lower low (LL), then we’ve got some hidden divergence in our hands. Lastly, we’ve got hidden bearish divergence. 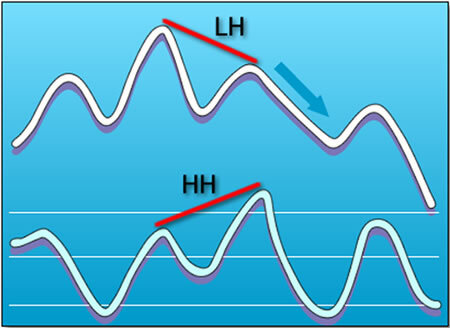 This occurs when price makes a lower high (LH), but the oscillator is making a higher high (HH). By now you’ve probably guessed that this occurs in a DOWNTREND. When you see hidden bearish divergence, chances are that the pair will continue to shoot lower and continue the downtrend. Let’s recap what you’ve learned so far about hidden divergence. If you’re a trend follower, then you should dedicate some time to spot some hidden divergence. If you do happen to spot it, it can help you jump in the trend early. Keep in mind that regular divergences are possible signals for trend reversals while hidden divergences signal trend continuation. In the next lesson, we’ll show you some real-world examples of when divergences existed and how you could have traded them.